What this nation needs today are a few good men. Men who will live by the Biblical principles of honesty, courage, loyalty, self-discipline, and above all, GODLINESS. Over the past several generations, men have lost a great deal of their masculinity. Christian marriage, parenting, government, business, and the church have been damaged as a result. 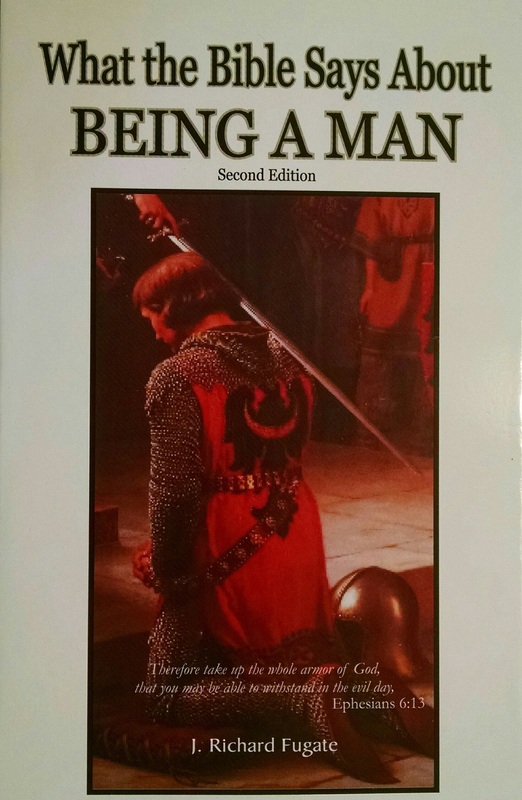 “Being a Man” explains this demise, the Biblical roles of Christian masculinity, and the road back to responsible Biblical Manhood. If you are a Christian man who would like to be a Spiritually-mature leader, this book is for you. God intends for Christian men to be conquerors in this world. Are you ready to be one? I read your book. . .and I just want to say thank you for your insightful gift. This book has changed my perspective on life. I am 42 this week, and I am glad I read this book. My wife and I recently attended a marriage class sponsored by one of the men of our church. Anyway, my wife also read your wife’s book, and it moved her as well. I think that some of this information can be translated to teens, so I am creating a series on both books for them. The Lord has given me a burden for the teens so I will be starting a class this summer for them. Additionally, I am teaching an adult class about expanding your teachings, and I have used some of your references in the book to supplement my material. Anyway, thank you and I pray that the Lord continues to move you and bless you to write more practical nuggets of gold. This is a great book! It’s very conservative and Scripturally sound. The first part of the book is a philosophical look at the many misconceptions of what it means to be a man, followed by a Biblical look at what it means to be a man, an examination of man’s role as “Provider”, “Protector”, and what it means to “cherish your wife.” It discusses Biblical leadership, characteristics of a leader, and what it means to be a father. This is an excellent Biblical guide for any man, young or old, seeking to live a God-honoring life. My boyfriend at the time, now my fiancé, loves it; he plans to continue to reference it for many years through our marriage. Thank you! A must read for pre-marital counseling or for a boy going into manhood to read. Biblically right on, explains how culture over time has emasculated men, and talks about what a real man looks like. Great book for every Christian man to read. I do not necessarily agree with 100% of what he writes but for the most part it has been helpful in pointing out a few changes I need to make in my life and the way I treat my fiancée. I definitely recommend!!! Mr. Fugate does an outstanding and unapologetic overview of biblical principles of manhood. He has also done a great job exposing many western misconceptions surrounding the definitions of masculine behavior. This book is a true beacon for the modern man seeking to live life after the Lords original design in a fallen (and very confused) world. I bought 4 of these books, one for a troubled nephew of mine and the other three for me, his grandfather, and his stepfather. I then scheduled a conference call for each Wed night and we read a few chapters to discuss in advance. My nephew has never known his father. He was spending about 6 hours each day playing video games. He had started to try marijuana and was very argumentative with his stepfather. Once we started the calls, everyone on the call was engaged each time, and there was good sharing and discussion about our life experiences. Instead of just listening, he was engaged and had his own input on several of the subjects covered. The hope was to just relate with the “men” and help him get a vision for his life. Halfway through the book, his Xbox died. Instead of replacing it, he sold all the games about a week later – never went back. God works in mysterious ways! He went looking for and found a job because he wanted to earn money. He’s never been motivated to do that before. This book may have changed his life. It hits the main points that need to be addressed with the males of our culture abdicating their roles as reliable husbands, strong fathers, and leaders of their families. Until we can overcome the self-indulgence and self-focus of our lives, our families and culture will continue to decline. We must take action to reverse this situation, and reading this book with your sons or a group of other men is a great start. Thanks to Mr. Fugate for telling it like it is.